Within Teamwork Projects you can move an unbilled time log to another project. In the Time section of your project, hover over the time log you want to move and click the edit pencil to the right. In the edit time log modal, you will see an option at the bottom to Move to Another Project. When you click the Move to Another Project option, you will be able to select a new project to move the time log to. You can also select a task to associate with the time log. 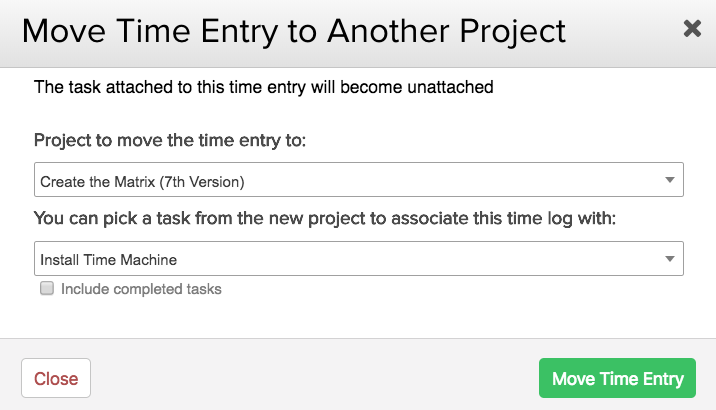 If the time log you are moving is already attached to a task on the current project, it will become unattached in the move. Note: You cannot move time logs that have already been billed.